Middle eastern music tends to be flexible when it comes to melding with other genres. We can start with Tinarawen--whose album Elwan made my Top Five for 2017--and how they've mixed a solid Northern African sound with Mississippi delta blues. I can hear the same influences in everything from Tool to the umpteen covers of "Caravan" I've listened to this year. And while it is slightly ignorant of me to lump all Middle Eastern into one pigeonhole, it's easy to spot those influences in any piece of music, to identify it as such. 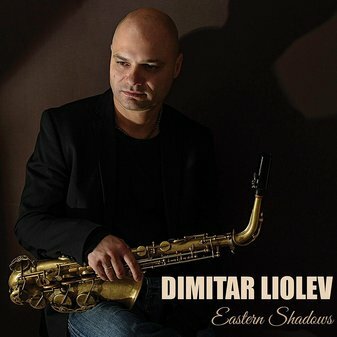 That was my first thought while listening to composer and saxophonist Dimitar Liolev's new album, Eastern Shadows. (Dang it, I keep typing "Eastern Promises.") 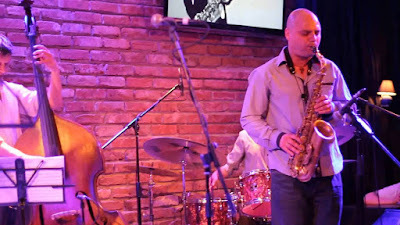 You can hear those same broad influences from the opening seconds, even though Liolev is presenting this music from a basic jazz quartet--horn player Martin Tashev, bassist Massimiliano Rolff and drummer Dimitar Semov. From the title, I deduced that this is yet another jazz composer who's obsessed with the intersection between east and west, which isn't necessarily a bad thing. It's just that I've heard this before, and recently. As you move through these nine original compositions, you start to peel away the layers of the onion and discover this music has little to do with the Middle East per se--"Eastern" refers to "Eastern Europe." To be even more specific, Liolev is Bulgarian. His homeland is a place where east and west are already colliding. He borrows heavily from Balkan folk music to whip up these otherwise straightforward jazz improvisations and the result is closer on the spectrum to bebop than a tropanka. Lilev's sax is out front, usually playing off Tashev's trumpets and flugelhorns, with only occasional Balkan flourish to set the mood for what comes after. It's a balancing act, one done with considerable finesse. Perhaps that's because the two genres blend so naturally with each other that you aren't completely aware of its hybrid nature. You can approach Eastern Shadows from an intellectual angle, uncovering those Balkan influences and determining how they take the music in a different direction, or you can just go with the flow and take it at face value--intriguing, well-played jazz with exotic touches right around the edges.